At Coral Medical Health Spa in Windsor, Ontario, we’re very excited to offer laser birthmark removal (including, Port-wine Stains, Nevus of Ota and Café-Au-Lait marks)! Specializing in a number of Medical Cosmetic Treatments including Cosmetic Hyaluronic Dermal Fillers by Juvederm and TEOSYAL, Intense Pulse Light (IPL) Hair Removal & Laser Hair Removal, Intense Pulse Light & Laser Photorejuvenation by Palomar Medical, and BOTOX Cosmetic, we are proud to announce this new treatment to our line of services. From Lutronic this specialized Q-Switch medical laser technology is considered to be one of the most effective lasers to treat birthmarks, including Port-wine Stains, Nevus of Ota and Café-Au-Lait. Dr. Zoia Sherman M.D, a board certified Anti-Aging Specialist, has been researching laser birthmark removal since this laser technology became available. The Lutronic Q-Switch laser birthmark removal for Port-wine Stains, Nevus of Ota and Café-Au-Lait marks was her choice for its efficacy and safety in laser birthmark removal! We provide a complementary consultation with Dr. Sherman before any laser birthmark removal treatment begins. for any type of mark including Port-wine Stains, Nevus of Ota and Café-Au-Lait. Pricing starts at $99 per treatment and varies based on the time required for the treatment. Birthmarks are generally treated until no further lightening occurs. Approximately five percent of people are born with one or more types of skin discolorations commonly referred to as birthmarks. Birthmarks may be vascular in nature ranging from flat capillary hemangiomas or port wine stains to large raised vascular growths or hemangiomas. Brown pigmented birthmarks or café au lait spots are also commonly noted in a significant number of newborns. Nevus of Ota is a blue-black birthmark commonly seen at birth or developing in the first few years of life. Fortunately new advances in laser surgery have enabled us to remove or improve many of these conditions. 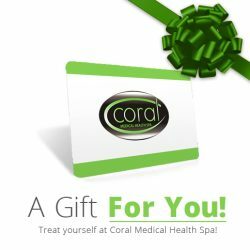 At Coral Medical Health Spa we have a number of unique vascular and pigment lesion lasers capable of treating port wine stains, hemangiomas, café au lait lesions and nevus of Ota. Nevus of Ota or blue-black facial birthmarks can be treated using newer Q-Switched Ruby, Alexandrite and Neodymium-YAG Lasers. Birthmarks are congenital (present at birth) abnormalities of the skin that are seen in approximately 5% of the population. Birthmarks may be composed of blood vessels, (port wine stain or hemangiomas), pigmented cells called café au lait (coffee and cream) or blue black dermal stains called nevus of Ota. Port wine stains can occur anywhere on the body and may rarely be associated with underlying abnormalities of the eye and brain. Port wine stains show diffuse collections of dilated capillaries in the dermis thus their name capillary hemangioma. New treatments using pulsed yellow and green light lasers can improve or eliminate many of these lesions. Hemangiomas are raised vascular tumors that may be found in superficial or deep (cavernous) locations in the skin. Hemangiomas may undergo rapid growth in the first few weeks of life and may present problems secondary to compression of vital structures (eye, neck). Evidence suggests that hemangiomas are best treated early in life prior to there rapid expansion phase. Multiple lasers are available, at our center to address these vascular tumors. Pulsed yellow, green light, Alexandrite and ND-YAG lasers are all used to treat these lesions depending on size, color and anatomic location. Pigment birthmarks are divided into superficial epidermal (café au lait) or deep (nevus of ota) varieties. Café au lait birthmarks are caused by excess melanin deposits in the epidermis and respond very favorably to pulsed green light lasers. However, there is approximately a 50% risk of recurrence requiring re-treatment. Nevus of Ota shows good to excellent response using Ruby, Alexandrite or ND YAG lasers. Multiple treatments are required to eliminate the collections of pigment cells seen deep in the dermis. If you or someone you know is concerned about their birthmark and would like more information on birthmark removal or improvement, please contact us for a complementary consultation with Dr. Sherman. From there our certified laser technicians will work to treat your condition quickly and effectively.